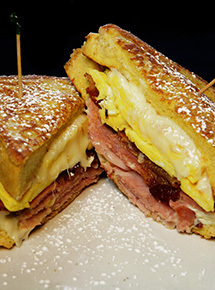 Start your day with a hearty, satisfying breakfast sandwich. Find your favorite combination of ham, bacon, Swiss cheese, and scrambled eggs served with strawberry preserves and syrup! Fresh lettuce topped with feta cheese, tomatoes, cucumbers, beets, onions, olives, and peperoncinis. 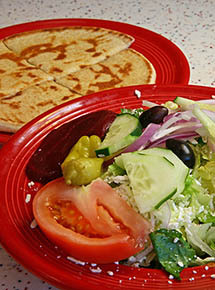 Broiled chicken breast with tomato, onion, and tzatziki served in a warm pita, with a side of crispy French fries. 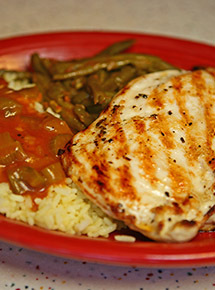 One broiled marinated chicken breast served with your choice of soup or salad and rice & green beans or French fries. A combination of Spinach pie, Moussaka, and Pastitsio. 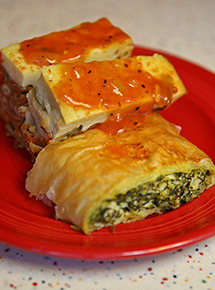 Spinach pie is filled with feta cheese, spinach and greens in a flaky phyllo dough. Moussaka is layered with eggplant, zucchini and potatoes with ground beef and bechamel baked on top. Pastitsio is thick spaghetti noodles with ground beef and bechamel baked on top! 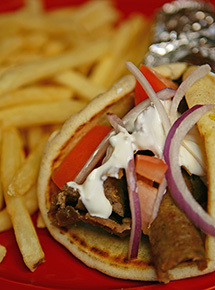 Beef and lamb gyro sandwich with tomatoes, onions and tzatziki. 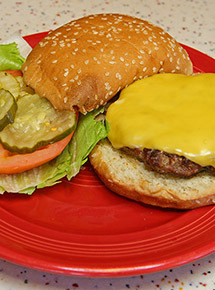 Served with soup or salad and rice & green beans or French fries.